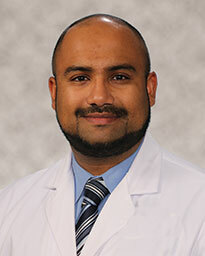 Dr. Shariq Khwaja practices radiation oncology with clinical interests in intensity-modulated radiation therapy, image-guided and adaptive radiation therapy, advanced localization systems, partial breast irradiation, Gamma Knife® and LINAC-based radiosurgery, prostate low dose-rate brachytherapy and high dose-rate brachytherapy for prostate, gynecological and breast cancers, SpaceOAR® hydrogel system for prostate cancer treatment, as well as pediatric malignancies. Dr. Khwaja earned his M.D. and Ph.D. at the Mayo Clinic in Rochester, Minnesota, through the Mayo Clinic Medical Scientist Training Program. After his internship in internal medicine at Parkland Memorial Hospital/The University of Texas Southwestern Medical Center in Dallas, he went on to complete his radiation oncology residency at Barnes Jewish Hospital/Washington University School of Medicine in St. Louis, Missouri. He was the recipient of an Integrated Clinical and Translational Science Research Award in 2014. His project on human papillomavirus-related head and neck cancer biomarkers was awarded the American Society of Radiation Oncology Clinical Research Award in 2015. The following year, he was the recipient of the Radiological Society of North America’s Roentgen Resident/Fellow Research Award. Dr. Khwaja is the coauthor of articles published in the International Journal of Radiation Oncology Biology and Physics, Cancer Medicine, Otology and Neurotology, Clinical Breast Cancer, American Journal of Clinical Oncology and Journal of Clinical Investigation, among other journals.